History is a very interesting subject. It tells us so much about our civilization and others’. If you read it carefully, sometimes one can unravel very interesting facts about civilization and cultures. One such similarity lies between India and Japan - countries that are separated by 6000km. As strange as it may seem, India’s relation with Japan is centuries old. It was during the reign of the Japanese emperor Kemmei that the contact between Japan and India was established. This relation has been epitomized by spiritual, cultural and civilization affinity. 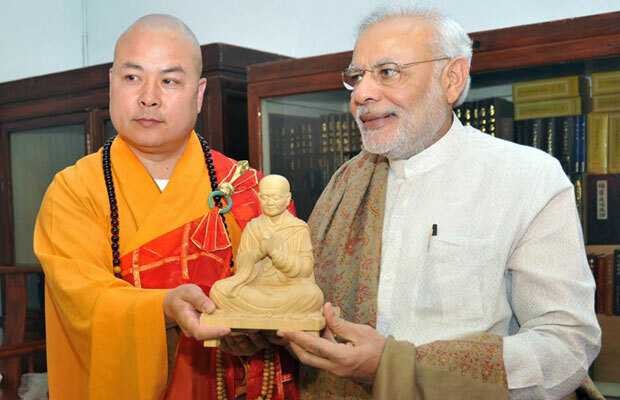 The Japanese consider India, a country with great charm, cultural heritage and as the motherland of Buddhism. Japan is also the place where the fire of nationalism was lit in the form of INA by freedom fighter, Subhash Chandra Bose. Historically, among the Indians to be closely associated with the Japan were the Hindu leader Swami Vivekananda, Nobel laureate Rabindra Nath Tagore, entrepreneur JRD Tata and Judge Radha Vinod Pal, who won the admiration of millions of Japanese with his dissension at the Tokyo Tribunal, by questioning the validity of Victor’s justice. India had also gifted an elephant to the Ueno zoo in Tokyo, Japan as early as 1949, which was named Indira, after Indian Prime Minister Jawaharlal Nehru’s daughter, to cheer the spirits of the defeated Japanese empire after World war II. India’s earliest recorded relation with Japan was with the Todaiji Temple in Nora, where the eye-opening ceremony or consecration of the towering statue of Lord Buddha was performed by an Indian Monk, Bodhisena, in 752 AD. The similarities are exemplified with even the cities existing in these two different countries. 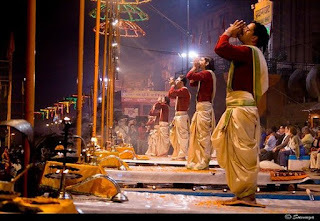 Varanasi, widely known as Kashi, is one of the oldest continuously inhabited city in India. 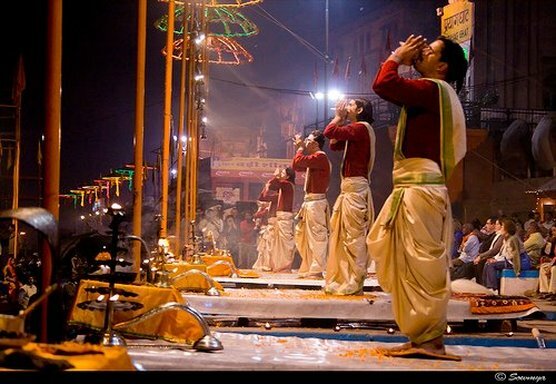 It is popular for numerous temples and Ghats, especially the Kashi Vishwanath Temple. Kyoto in Japan, has been imperial capital of Japan for more than 1000 years and boasts of thousands of shrines. Both Kyoto and Varanasi are located on the banks of rivers - Varanasi is located on the bank of most revered river - the Ganga, while three rivers, namely Yodo, Kamogawa and Katsura, flow through Kyoto. In terms of religion too, as per Shintoism, the pure mind Buddha is considered to be the serene beholder. This is identical to the belief of the ‘Nirgun Bhraman ‘ in Hinduism, with all the gods being regarded its emanations, which is again very similar to the Shinto concepts of Kami, the spiritual essence or the spirit. Further, Shintoism, the aboriginal religion of Japan, preaches that everything in nature is composed of Kami. The primary Kami is ‘Amaterasu’ or the Goddess of the sun. Hence, Japan is revered as the land of the rising sun. This is very similar to Hinduism in which we are considered 'Suryavanshi', descendant of the Sun. In Hinduism, the whole universe is regarded an emanation of ‘Paramatma’ therefore everything in it bears the spirit of the great creator. 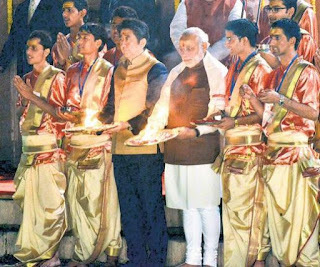 This spiritual bond was best exemplified when the premier of both the nations, Shinzo Abe and Narendra Modi ensconced themselves in the embellished ‘Dasaswamedh ghat’ for their obeisance to the sacred Ganga. This spiritual touch to politics was displayed even by PM Modi when he visited prominent Buddhist temples of Toji and Kinkakuji in Kyoto, Japan. The speciality of this ancient Toji temple is that it is imbued with the philosophy of Hindu gods- Brahma, Vishnu and Maheshwara.